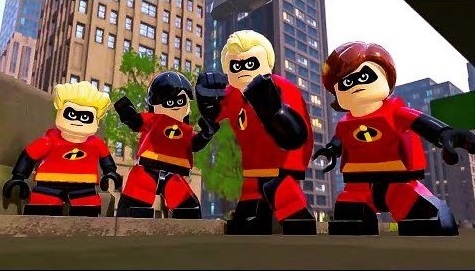 At heart, LEGO The Incredibles is like any other in the block building series. Sock enemies, bash blocks and build new LEGO structures, drive vehicles, use teamwork, and solve puzzles. Collect LEGO studs to buy new characters to use in Free Play, and find hidden red and gold LEGO bricks to unlock cheats and other goodies. Just like the other games, a second player can join in and hop out at any time for some co-op fun. You can also create your own superhero by visiting Edna’s house. Between levels, you’ll tromp through a huge city where The Incredibles universe takes place. This part of the game reminds me of a scaled down LEGO City Undercover. You’ll explore the city and find crimes to stop. Sometimes a whole district of a city is taken over by a “crime wave” and you’ll have to complete missions and defeat wacky new villains to clear the area. You’ll also collect special hidden multicolored bricks and when you have enough, you can build special structures on certain panels. These are called Family Super Builds and the whole Incredibles family will help out to build these as you play a button mashing mini-game. You can even unlock super secret characters from other Pixar films, like Dory from Finding Nemo! The only problems I had with the game are very minor. I kind of wished you could’ve started the game with the original movie and not the sequel first, which seems odd to me. And at only 12 main levels, this is one of the shorter LEGO games, although the city area adds a lot of replay value. Luckily I didn’t encounter any game freezing bugs like many LEGO games have, but one time the sound did cut out and I had to restart the game to get it back. But otherwise, if you loved The Incredibles movies or a just a Pixar fan in general, you’ll enjoy this game, too. LEGO The Incredibles is rated E-10 with ESRB descriptors of Cartoon Violence and Crude Humor. You can punch, shoot, and zap bad guys, but they just fall down or go to pieces when defeated. They make it perfectly clear that everything is made out of LEGOs, so violence isn’t really that bad. There is a bit of pigeon poop humor, too. I’d be OK letting any kid play any of the LEGO games, personally. If you’re comfortable with your kids watching the movies, they’ll be OK with this game, too. If you are defeated, you just appear right back where you were with a minimal loss of studs, so it’s not too frustrating. Even though the game has tons of spoken voice, reading skill is still helpful for the menus and tips. If a younger player does need assistance, another can join in at any time. Which is always recommended, as LEGO games are more fun with a friend anyway. Plus, kids love super heroes, but there isn’t a lot of super hero games made for kids.